Industrial warehouse shelving is not limited to one type or size. There are various types, sizes, and styles to choose from – exploring all of the options is the best way to customize your warehouse in order to maximize your industrial space. • How big is my storage space? • What items will be stored here? • How big are the items that need to be stored? • What shapes are the items? • What are my product flow requirements? • What type of environment am I storing in (humid, freezer, etc.)? Industrial warehouse shelving can be used to outfit your entire space, or just a small section of it. The best part of using shelving in your industrial warehouse or storage space is that it can be customized to fit your specific needs, as well as combined with material handling storage solutions for maximized efficiency and density. Shelving can be easily adjusted to accommodate a range of product sizes. Rivet shelving, also known as boltless shelving, is easily assembled and does not require nuts, clips, or bolts. Rivet shelving offers a variety of beam options to accommodate light to heavier loads. It is ideal for small parts storage, hand picking, backroom storage, and archive box storage. Rivet shelving can be designed as a multi-level storage system. Wire shelving is ideal for storage of items that require more air circulation, such as food and electronics. 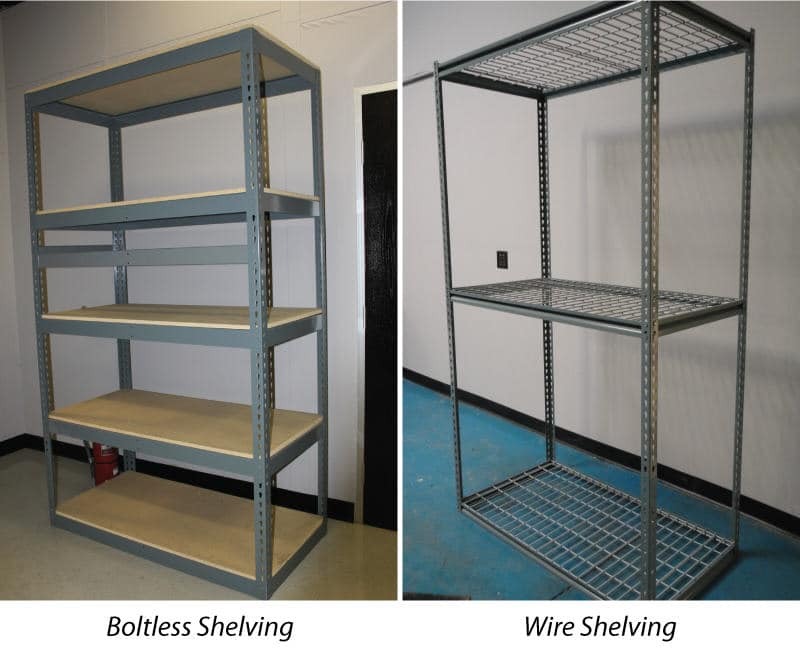 With storage capacities of 600-800 lbs., wire shelving is suitable for heavy-duty applications and is available in chrome, stainless steel, and epoxy coated. 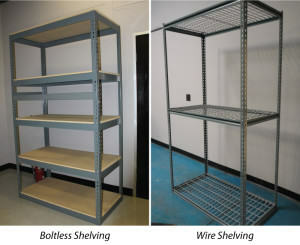 Wire shelving can also be fitted with casters to provide mobility. Industrial steel shelving can be utilized as a single level or multi-level system. Multi-level steel shelving systems are typically designed with two or three levels and are an ideal way to maximize vertical storage space. Steel shelving can be outfitted with bins or drawers for organizing inventory. 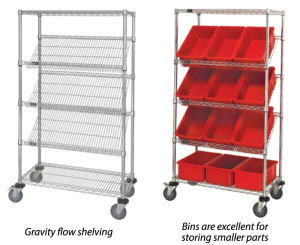 Gravity flow shelving is a first-in, first-out shelving option. It is available in many widths, lengths, and load capacities, and can feature rollers, dividers, entry guides, entry stops, bins, or casters. 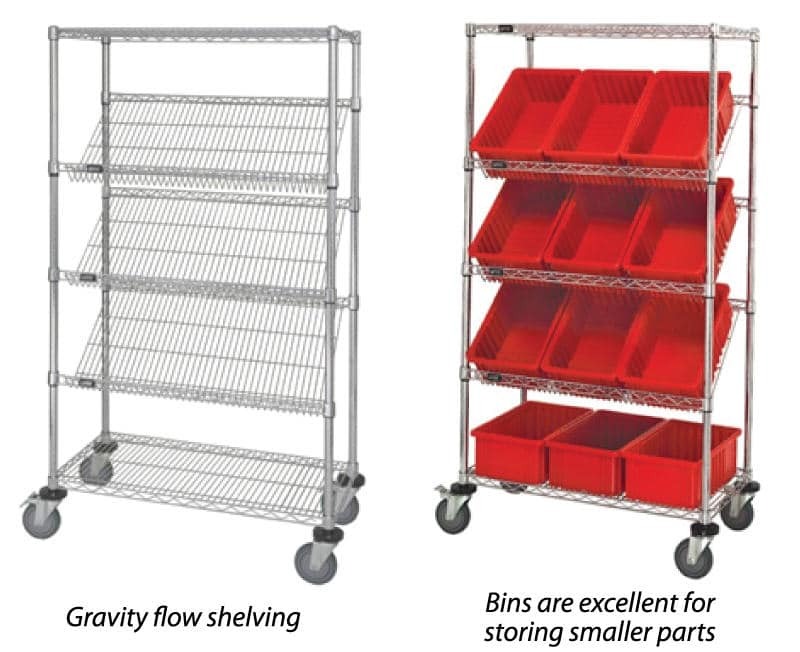 Gravity flow shelving is ideal for storing date-sensitive materials, small parts, and retail applications. REB Storage Systems International offers standard and customized shelving options nationwide. Our Project Management and Engineering Team are trusted professionals who will work with you every step of the way; from designing the optimal storage solution for your needs, managing subcontractors, shipping co-ordination, installation and final permitting. After your system is complete, we can recommend ideal Material Handling Products that will help your operation run more efficiently. For advice on which is the best industrial warehouse shelving option is right for your storage needs, simply submit a form or give us a call at 800-252-5955.